I saw this recipe on Ten Dollar Dinners and tried it out for part of our dinner. It is pretty labor intensive – you will be chopping a lot! 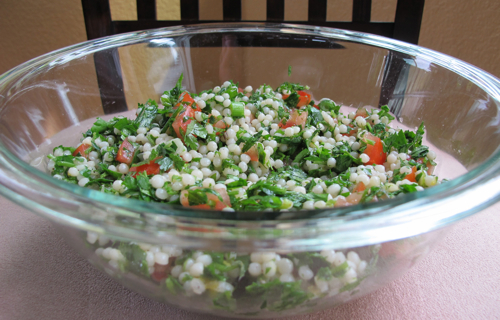 It is a neat take on a traditional tabouli salad. Israeli couscous can be harder to find than normal instant couscous, Trader Joe’s carries it and in most grocery stores you will find boxes hidden in the Kosher section so look around. Bring a tall saucepan of water to a boil, add the couscous and cook for 8 minutes, drain and let cool. In a small mixing bowl whisk the oil, lemon zest, lemon juice, salt and pepper. Meanwhile chop finely the parsley, cilantro and mint, finely chop the green onions and add to a small mixing bowl. Quarter the tomatoes and remove and discard the core and seeds from each section, chop into small pieces. Toss the couscous with the dressing and then the herbs and tomatoes, stirring well. Cover and let chill for a couple of hours. Serves up to 8 amply. Wow… I still don’t know how to say it but it looks so good!